The Po Lin monastery at the foot of the steps up to the Buddha welcomes all – they were even offering free food samples when we were there. You then climb 260 steps to the most amazing sight. The Buddha is absolutely huge and on clear days, the view is fantastic. Sometimes the statue is even shrouded in cloud! Similarly, if you head to the site via the MTR operated Cable Car (formerly the Sky Train), you’ll get some great views along the way. Don’t be tempted to ignore the Monastery and just climb the Buddha’s steps. We feel that you need to spend time at both to understand why the site is so special. Allow plenty of time for climbing the steps as it is much further than it looks. Under the Buddha’s pedestal you’ll find an exhibition space too. The Po Lin Monastery is open to the public from 9am until 6pm daily. Access to the Tian Tan Big Buddha is available from 10amuntil 6pm daily. Entry to the Monastery and access to the Buddha are both free. At the cable car station near the Buddha at Ngong Ping also has a retail and entertainment centre which is worth a visit if you have time. A simple way to see the Buddha is to take the Organised Day Trip. The Disneyland park is one of the newer features of the island as it was built around 2005 and inside you’ll find the usual Disney attractions. Disney has its own hotels and transport links. To get to Lantau Island, you can take the MTR but we went by high speed boat from the Central Ferry pier which was great fun. We then took a bus to the Buddha. Don’t go on a Sunday as there are surcharges on public transport. Your journey to the site by bus will be a long and winding one, but you do get to observe life on Lantau Island out of the window along the way. The first glimpse you get of the Buddha is usually an awe inspiring one. 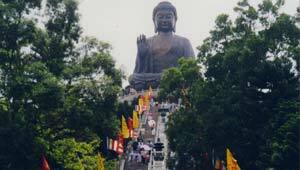 The Buddha and the monastery are located at Ngong Ping on Lantau Island, Hong Kong. To get there, take bus Number 2 from the Lantau ferry port or bus number 23 from the Tung Chung MTRStation. Journey time on both busses can be lengthy. The fastest (and most expensive) option is to travel by cable car from Tung Chung to Ngong Ping. The journey takes 25 minutes. Alternatively, consider joining an Organised Day Trip.